Two hundred yards east of U.S. Route 3, six miles north of Pittsburg Village on Hill Road over Perry Stream. The bridge is 60'6" long with a clear span of 55'9". It has an overall width of 19'5" with a roadway width of 15'6" and has a maximum vertical clearance of 12'4". It is closed to vehicular traffic. Happy Corner was a bustling neighborhood in the late 1800s. At the Perry Stream crossing there was a sawmill, a starch mill, a store with a post office, a barbershop, and the Temperance Hall. Nearby was the Danforth School. It has been stated by the Pittsburg Historical Society that before the building of the bridge, people used to ford the stream just upstream, where the water was shallow. The following story is one of several that tell how the bridge got its name. There was an elderly gentleman who lived in a house which is still standing on the northeast corner of the crossroads. This gentleman liked to sing and dance, and he owned a Victrola which he played frequently. People congregated at his house generally had a "happy" time singing and dancing. That's why the crossroads was called Happy Corner. 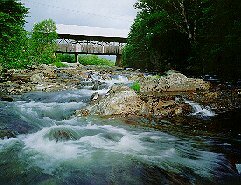 Happy Corner Bridge is one of the oldest covered bridges in northern New Hampshire. In the mid 1960s, it was repaired by the state at a cost of $12,000. The cost of the repairs was shared by the town of Pittsburg and the state. The Happy Corner Bridge is eligible for listing on the National Register of Historic Places.